The 17th Ferrocene Colloquium will be held from February 24 to 26, 2019, at the University of Rostock. Initial nucleus of the Ferrcocene Colloquium was a group of researchers who shared an original vital interest in the growing field of Ferrocene-based chemistry and therefore founded the Ferrocene Colloquium as a scientific exchange platform in 2003. Over the years, it has developed to a well-established European forum for organometallic chemistry in general, highlighting the chemistry of metallocenes and any kind of other π-complexes in particular. Potential topics range from synthesis, chemical properties and reactivity of new compounds, their use in catalysis, electrochemistry, photochemistry, and materials science to medical aspects. 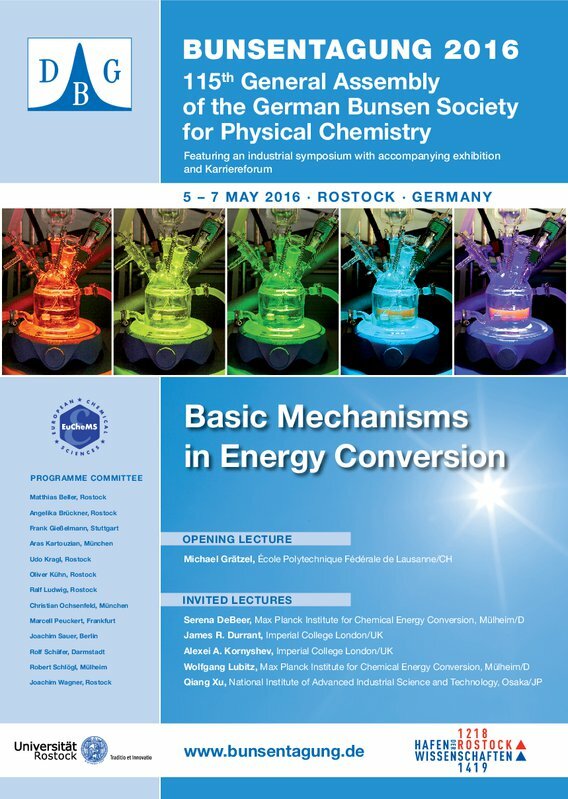 The Colloquium will be jointly organized by the Institute of Chemistry and the Leibniz Institute for Catalysis. Six leading international experts will present keynote lectures demonstrating the diversity of the field. In addition, the meeting will provide an excellent platform for PhD students as well as principal investigators to present their research either in form of a poster or a talk. The traditionally rather workshop-like character of the Ferrocene Colloquium is perfect to initiate and foster discussions and exchange of scientific experience between young reserachers and experts. In 2019, our University celebrates its 600th anniversary. We consider this a good occasion to discuss organometallic chemistry for the future. We are looking forward to welcome you in Rostock! The 5th International Conference on Biocatalysis in Non-conventional Media will take place on 9th – 11th of May 2017 in Rostock, Germany. This conference is hosted by the European Federation of Biotechnology (EFB) Section on Applied Biocatalysis (ESAB), which aims to stimulate the scientific and industrial interest in applied biocatalysis. The conference will cover recent achievements in this field and provide a platform to discuss future opportunities and challenges. 115th General Assembly of the German Bunsen Society for Physical Chemistry featuring an industrial symposium with accompanying exhibition and Karriereforum.